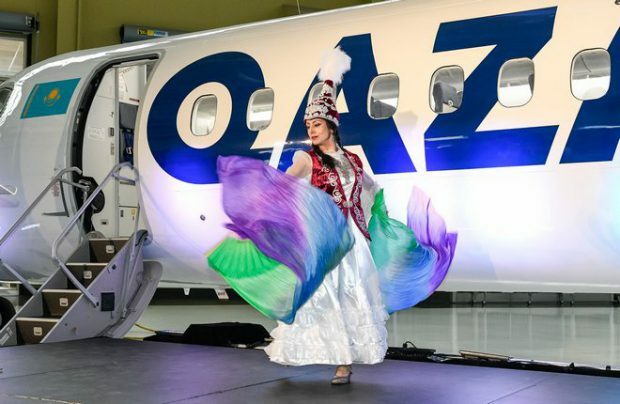 Qazaq Air, Kazakhstan’s state-owned regional airline, has accepted delivery in Toronto of the first of two purchased Bombardier Q400s. They were ordered in 2017 following the Almaty-based carrier’s successful launch of domestic services in Kazakhstan in July 2015 using three leased Q400 turboprops. With the newly delivered unit, registration number P4-FLY (MSN 4595), starting regular flights by the end of April, the next fleet addition of the same aircraft type is scheduled for May. By early summer, the all-Bombardier fleet of the airline will consist of five Q400s. By growing its fleet, the carrier is expecting to increase the frequencies of flights on existing domestic routes, as well as launching regular flights to international destinations. It has already scheduled flights to neighbouring Russia and Kyrgyzstan in the coming IATA summer season. The first three international routes will link Almaty with Bishkek and Osh in Kyrgyzstan, and Atyrau with Astrakhan in Russia. The dynamically expanding regional airline, which plans to serve half a million passengers this year, is 100 per cent owned by the Samruk-Kazyna Sovereign Welfare Fund.